The height and weight of rowers have a direct correlation on the power of their stroke. University of Copenhagen exercise scientist Niels Secher's research shows that elite rowers are tall and have lean, muscular bodies. The ideal height and weight for women rowers depends on the weight classification of the boat, but share the need for low body fat content. Secher's research attempts to correlate the speed at which a rower pulls and their body weight. In his presentation "150 Years of Scientific Enquiry about Rowing," he reports that there is no link between a rower's strength and how far the rower extends his back or legs. He believes that improved training and increased physical dimensions have led to better boat speeds and velocity over the past 150 years. In the book "Physiology of Sports," Secher states that rowing is directly connected to weight. He writes, "It seems that less successful oarsmen are also lighter." His research showed that when variables including equipment weight were controlled, that oarsmen weighing 90 kilogram, or approximately 199 pounds, performed 2 percent better in speed and strength than 155-pound, or 70-kilogram, rowers. Secher connects this research to men and women in his presentation. Oxford University physics instructor Ana Dudhia explains that Sir Isaac Newton's third law of motion -- every action has an equal and opposite reaction -- is evident in rowing. A rower pushes water in one direction and the boat moves in the other. Her research shows the boats momentum is contingent on the rower's ability to push water faster with an oar. Her complementary research, "Effect of Weight on Rowing," correlates the weight of the rowers to the maximal amount power they can produce together. The two traditional weight classes in competitive rowing are lightweight and heavyweight. U.S. Rowing, which sets the rules and governs the sport in America, states in rule 4-106 that female lightweight rowers may not exceed 130 pounds. Furthermore, the average weight of all the boat's rowers cannot surpass the 125-pound mark. There is no minimum weight threshold for lightweight or heavyweight, which is also call open. The boat's coxswain controls the rudder to steer the boat and directs the crew's stroke speed. While they do not pull an oar, their weight affects the performance of a boat. Coxswains add extra weight to the boat, which is why most crews seek short and/or thin people for the role. U.S. Rowing rule 4-109 states that the coxswain for a women's boat must weigh at least 110 pounds, not including excess clothing, stroke monitors or other equipment that may be carried in the boat. Not meeting this threshold means that the boat must carry deadweight, in the form of sand, dumbbells or other substance, to meet the requirement. Coxswains weigh in with their boats before the race, but their weight does not count in the average boat weight mentioned. 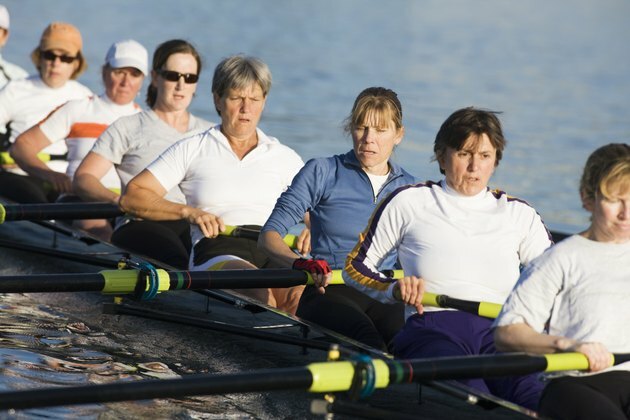 U.S. Rowing reports that the average woman rower is approximately 6 feet. A review of the 2013 U.S. Senior National Team shows that the female open rowers range between 5 feet 4 inches to 6 feet 3 inches, with weight between 110 and 185 pounds. The lightweight squad tips the scales between 121 and 130 pounds, with heights between 5 feet 5 inches and 5 feet 10 inches.